I’m working on a MB01 build for fun. Trying to see how accurate I can make it in stock form without throwing tons of money at it. 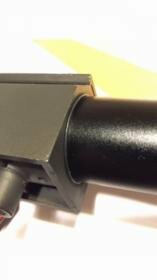 I was messing with the outer barrel to see if I could tighten the outer barrel to the receiver without having to rely on the small set screw to keep it from rotating. It just bugs me that a small set screw is used for this purpose. I’d rather have it headspaced properly for a tight fit. Maybe this trick has already been discovered and mentioned in this forum. What I learned is that the threads on the outer barrel bottom out on the receiver at the muzzle end, not the breech end. 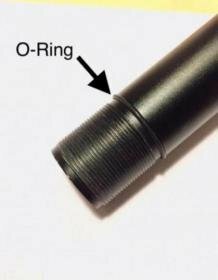 I removed the inner cylinder bushing ring and found that the barrel threads into receiver the same amount regardless of whether the cylinder bushing is installed or not. At first I was thinking I could shorten the barrel slightly at the breech end in order to rotate the barrel one more complete turn, but then my headspacing of the cylinder head and hop up chamber would be off and probably not allow me to fully lock the bolt since the hop up chamber would be moved more rearward toward the breech. So I thought maybe I could make a wider bushing so the barrel would tighten against the bushing. I’ve heard this has been done with the VSR. You just keep sanding the bushing down until you can tighten the barrel where you need it to get a perfect fit. I found an even easier solution. I stretched a thin o-ring over the threads on the outer barrel between the barrel and receiver interface. Now the barrel is extremely tight when I screw it down right to the point where it needs to be. In fact it’s so perfect that I can’t over rotate the barrel like I could before. I have to muscle it to get it lined up. I’ll still use the set screw but feel better that the barrel is now adequately tightened without it. Last edited by randomairsoft; 04-06-2019 at 10:55 PM.